The growing private space industry is built around these government space programs and would not exist without them. The UK's annual US$500m contribution to the European Space Agency (ESA) has catalysed the formation of the fastest growing industry. Its private space industry contributes US$15.2 billion a year to the economy. Similarly, Japan's US$2.3 billion into the Japan Aerospace Exploration Agency (JAXA) has enabled its private space industry to contribute US$31 billion. Not only do space agencies pay for themselves directly, they create jobs and are boosting the global economy by US$300 billion annually through private industry. The thousands of inventions and innovations spun out from space research have become an integral part of our daily life: weather forecasting, satellite television and communications, disaster relief, traffic management, agricultural and water management, and global positioning system (GPS), are but just a few. As space research required bigger and bigger investment, the nature of international research changed. 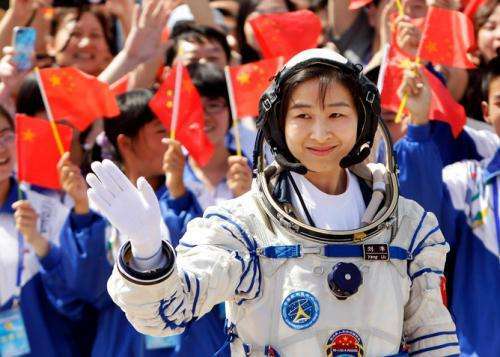 The space race became a space collaboration, which is symbolised by the International Space Station. If nothing else, as Pete Worden, Centre Director of NASA Ames, told me, "Space is cool". It inspires the new generation of kids. The Apollo missions inspired a generation. The number of US graduates in the science, technology, engineering and maths (STEM subjects), from high-school through to PhD, has doubled. The relative growth rate since then has dropped drastically, even though the total number has gone up. Doubling a population's scientific literacy when it is living in a world so dependent on science and technology was a good move, and it slung the US into the dominant position it has stood in for the past five decades. While they still inspire, some would say today's space agencies lack direction. Robert Zubrin, president of the Mars Society, said, "Instead of pioneering new worlds like those explorers of the past, we have left our sailors in the harbour for half a century to see the health effects from doing so". 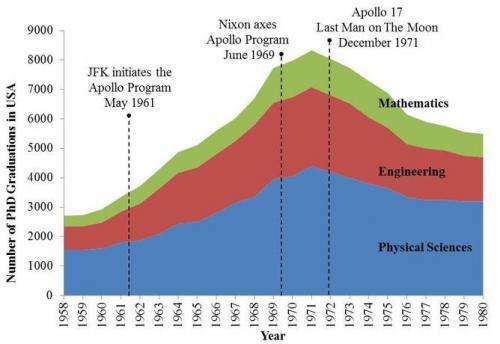 The average annual expenditure of NASA during the Apollo Era was US$23 billion in today's money. NASA's average spend in the last decade was US$17 billion. Even with similar budgets, the progress made in the last decade is simply not comparable to what was achieved in the 1960s. Space research has opened our eyes to real risks we face as a species: global warming, asteroids impacts, vulnerable ozone layer, and even warning about how our electronics would be affected by the sun. One way to push the speed of progress would be to make life multi-planetary. Visionaries like Astronmer Royal Martin Rees believe explorers would have a human base on Mars by 2100. He claims that if do not spread soon this will be "our final century". Space agencies around the world are slowly converging on the grand challenge of sending a manned mission to Mars. Mars is the next logical step. Zubrin said, "The Moon is to Mars, what Greenland was to North America in the previous age of exploration". Mars has all of the resources required for a technological civilisation. With a 24.6 hour day, fertile soil, a CO2 rich atmosphere, and an abundance of water, the introduction of flora is a real near-term possibility. Transformation of the atmosphere into something more hospitable may not remain science fiction. But it is no longer reasonable to just assume that the first human expedition to Mars will be carried out by astronauts from the US or Europe. As the late Jacob Bronowski once put it, "Humanity has a right to change its colours". Through industrialisation, the economies of China and India have been doubling in scale every decade, and are forecast to overtake the US by 2023 and 2048 respectively. Though some are still resistant, the West has slowly begun to realise that if it does not take the next step for humanity, someone else will. Coupling this ever growing obsession we in the West have with risk aversion, to the bureaucracy and difficulty of international collaboration, though I really want us to do it, such a mission would be impossible for us to achieve. Two privately funded teams, Inspiration Mars and Mars One, are set on sending a manned mission either to or around Mars in the coming decade. But Elon Musk, who leads SpaceX, is worried that the real question is not who, but when. He wonders "for how long humanity will have the technical capability of sending people into and beyond orbit." Space research doesn't actually produce any wealth - all its returns of investments are in the form of knowledge, which then has to be applied elsewhere for the actual gains. One has to ask the question if it would not be better to invest the money directly there rather than spend it on shooting people and ludicurously expensive equipment to orbit in the hopes that they may accidentally figure out something useful in the process. The fact that they sometimes do is not an indication that the money is well spent. Besides, many of the classical examples of space spin-off technology, like velcro, actually aren't. That's just clever PR - or when it's taken literally it's actually a bald lie. Much of the space technology is really applied terrestrial technolgy from other fields adapted to space flight, and then adapted back to terrestrial use elsewhere when someone thinks 2+2. For example, the turbopumps that later went on to serve oil and gas fields are credited to space technology. But many people forget that the idea originally came from designs by a German company Klein, Schanzlin & Becker that made high capacity pumps for firefighting, which were adapted to power the V2 rocket. The firefighting pump in and of itself would have lead to the invention of oil and gas pumps without the intermediate step of building the Saturn V and shooting a bunch of Americans to the moon. It's use in rockets simply made it more familiar to engineers in the west. Although the Rocketdyne F-1 engine either wasn't even made for that purpose. It was designed to lob nuclear weapons at Russia, but the customer USAF found they didn't need such a behemoth so they almost scrapped the plans before NASA came along and said "we'll take it". And then later on the public relations department made that sound like "We made it"
As if there isn't anything else to spend money on, like repairing the crumbling energy and transport infrastructures. Which is much more important and urgent than seeing whether we can shoot a man to Mars. You can play spaceman after you've secured the continuation of civilized human society on the planet. I agree that the above article is a blatant PR piece, but I think I could make a very strong argument that space investment does a lot more than just technology transfer. You mentioned infrastructure maintenance, but the most fundamental infrastructure in any society is people and their training/education. A healthy space industry will result in a lot more people trained in advanced technical skills. Those people don't stay locked into the space sector; they filter out into other industries on a regular basis. So, you might see engineers making patents at a big car company, for example, but keep in mind that the car companies hire a lot of aerospace engineers these days. The same goes for materials, optics, etc. The human infrastructure of a country is strengthened by space investment, and that acts as a force multiplier for all the other areas of technology. Aspiring to higher goals makes achievment of lower goals easier. If the scientists and engineers currently involved in space research were forced to turn elsewhere, they might start developing WMDs or designing better devices for spying on innocent citizens. It's a way of keeping them out of trouble, much like on the opposite end of the spectrum, big, dumb, hyper-aggressive brutes are made to feel like they are useful members of society by pretending football is somehow important or relevant. The universe is a dangerous place. The more we learn about it the more we come to realize just how dangerous it is. 1) We need to develop the means to divert impactors or avoid being extincted by them. 2) We need to protect ourselves from pandemics and geologic extinction events. 3) The ONLY WAY to do these things is to establish independent colonies elsewhere. -Exploration is knowledge. Knowledge is wealth because it tells us where to apply our efforts in order to get the best return. Current knowledge is telling us to establish an enduring presence in space. Of course human-haters and nihilists would disagree. There are already plenty of people doing these things. A WMD might eventually kill enough people to end civilization. Which is why we need to establish independent colonies out of the reach of these things. Yeah, I was thinking along those lines myself. Unless they want to take us back to an agrarian subsistence way of life, with millions of people dying needlessly of starvation and disease, then research is a foredrawn conclusion. Technological revolutions can happen in unsuspected places, and it would be foolish to deliberately steer away from any one branch of science, lest you miss the chance to discover the next great thing. The US government (and others) spend tons of money on all areas of research, including but not limited to space. If Berkely Labs creates an improved battery or solar panel, is that space research, agriculture, medical, automotive, consumer electronics, etc? Incremental advancements in technology can enable tech accross many fields, and this is why we fund it. You wanna really see people get inspired by space research and technology? Wait until it becomes possible for normal people to actually make money there (I know, long ways off, but still). It'll be somewhat similar to other periods of exploration that led to expansion and exploitation here on Earth. There should be a point where a boom of expansion will happen, though the high barrier to entry may limit the relative scope. However and whenever it happens, the allure of settling a new frontier is irresistable to people. If previous settlement of frontiers can be used as an example for the future, any bets on how long it takes before the first piracy and wars begin? What are you talking about? It produces tons of wealth. GPS, satellite communications, entertainment satellites, precision farming, remote sensing, etc. Micro- and nano-satellite technology is producing enormous wealth through increased efficiency, new capabilities, and new information. None of these even include the many spin-off technologies (e.g., http://en.wikiped...logies). It pays for itself many times over directly, plus the spin-offs, plus the wealth generated by the knowledge it generates, plus the investment value for the capabilities it adds like mining asteroids. Not to mention all of the non-financial benefits. It's a false dichotomy to talk about spending on space versus "better spent" on other things. Spending on space increases the amount of money available to spend on other things. Maybe it's time to realize that Earth is not invulnerable and DOES exist within a universe that extends more than 2 meters above its surface? The last dominant species that banked on ignoring that died out.